The Sony Xperia ZL is equipped with a 13 megapixel camera that can produce still shots with a maximum resolution of 4128 x 3096 pixels. However, if you use the default Superior auto mode, you only get 12 MP 3920 x 2940 shots instead. The difference between the Superior auto mode and regular mode with all settings set to auto is that the first tries to guess what kind of scene you are trying to capture and adjusts all image parameters accordingly. This includes color saturation, contrast, metering mode and what not. The regular auto mode only sets the exposure automatically, but lets you fiddle with the other settings if you prefer. Naturally, the Sony Xperia ZL camera offers all kinds of features, including face detection, smile shutter, geo-tagging, touch capture and HDR mode. There's also the home-baked quick launch mode, which lets you select what the camera shortcut on the lockscreen does. You can go for simply launching the camera in either still or movie mode, or you can set it to immediately snap a photo/start capturing video. This might come in handy for those occasions when you are worried that you might miss a shot, but it is also useful for when you don't want to waste your battery keeping the camera interface constantly going (it's a real battery hog). The camera module and firmware is the same we met within the Xperia Z and managed to disappoint us for a second time. In the Superior auto mode the Sony Xperia ZL produces photos with pleasing, albeit slightly oversaturated colors. The resolved detail is hardly spectacular and the noise levels are only average, but the dynamic range is good and contrast is excellent. The results are good overall, although we wouldn't say it has a significant advantage over the best 8MP shooters from last year. If you switch the regular auto mode, you get images that appear more natural and lack that overprocessed look. This gives you more headroom if you plan on post-processing your images, but resolved detail doesn't change significantly. Finally, just as on the Xperia Z, the default image processing of the Xperia ZL is far from stellar. As a result, the regular shooting mode produces shots that look worse than the ones, captured in Burst mode at 9.6MP resolution. Normal processing has super aggressive and quite clumsy noise suppression algorithm, which smears out the foliage and the roof tiles, while making the purple fringing around the white windows more visible. It does remove some of the noise though. The Burst shot mode, on the other hand, seems to skip this processing step and while the shots are slightly grainier, the foliage in the tree looks much better and you get much more detail in the fire escape and roof tiles. To recap, Burst mode gives you better per-pixel detail because it doesn't process the images as much. Were Sony to skip the heavy-handed post-processing, the image output would have been at an entirely different photo quality level. Using the Burst shot is a stop-gap measure (you lose resolution, FoV, touch focus) until Sony pushes out an update to fix things (if they act on this at all). Continuing with the camera tour, we also gave the Panorama feature a whirl. The smartphone produced a 5 megapixel image with punchy colors and only few stitching errors. It's not the best panorama we have seen, but it's certainly among the better performers out there. And here is an HDR sample. The Sony Xperia ZL challenges the best 13MP shooters in town and despite it resolves as much detail as the Galaxy S4 and LG Optimus G Pro, there is lots of edge fringing. Unfortunately, when it comes to a more real-life scenario (the third poster), the noise reduction takes its toll and the Xperia ZL photos further lose their appeal. The Sony Xperia ZL is capable of capturing 1080p video footage at 30fps, which is on par with most modern day smartphones. However, as a nice extra touch, the smartphone also offers HDR for video capture, making it only the third one to have that after the Oppo Find 5 and Sony's own Xperia Z. What came as a disappointment for us is the fact that even though the Xperia ZL is able to capture still shots while recording video, it only produces images with 1 megapixel of resolution. That's less than half the resolution of the individual frames in the video itself and not really good for much. Given that last year's flagships could capture full res stills during video recording, what the Xperia ZL offers is inexcusably poor. That's a minor thing however and what's important is the Xperia ZL does the major things right. Videos come up with very good detail and a solid 30fps framerate. Their bitrate hovers about the 17MBps mark, which is a decent compromise between quality and file size. Here is a 1080p video sample we've uploaded on YouTube. You can also download an untouched 1080p video sample as well. The benefits of the HDR mode are not always as easily visible as we hoped, but it still adds some detail in the highlight areas, which, on some occasions, can mean the difference between a usable and a poor video. You can download an untouched 1080p HDR video too. 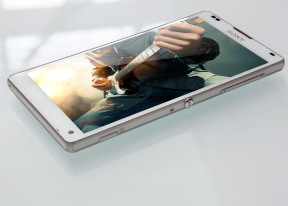 The Sony Xperia ZL enters the arena of our video quality comparisons. The 1080p video recording of the smartphone isn't quite the best we have seen, but it fares pretty well. It easily matched the Optimus G and the Galaxy S III in the first two charts, but came out a distant third on the third chart.